This makes me think of Shawne Merriman- a dominating force who wrecked havoc around the NFL for a short period of time. 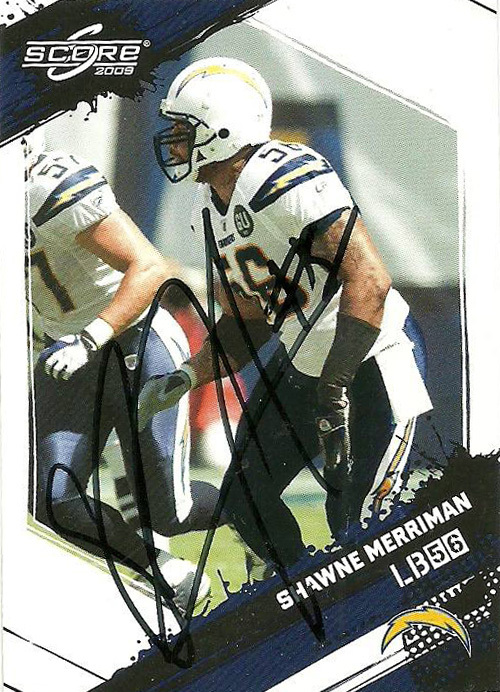 Merriman was a first round selection (#12 overall) by the San Diego Chargers, who had gotten the pick as part of the Eli Manning trade, during the 2005 draft. Shawne was an interesting specimen. He clocked in at 6’4″, 272, with a 4.6 40, and an impressive 40 in vertical jump. Shawne also had pretty solid stats while playing at Maryland, posting back to back 9 sack seasons, and 140 career tackles. The Chargers were going to use Shawne as a tweener both a linebacker and a defensive end. Shawne did not get into the starting lineup until almost the mid point of his rookie year- but he made the best of it, blowing by defenders for 10 sacks, 43 tackles, 2 forced fumbles and 5 pass deflections. For his efforts, he earned Defensive Rookie of the Year Honors in 2005, and captured his first Pro Bowl Honor. He returned in 2006 on a rampage, racking up 17 sacks, 48 tackles, 4 forced fumbles, 8 pass deflections, and an interception. It goes without saying that Shawne was named to the Pro Bowl and earned All-Pro, playing all 3 positions in the Chargers linebacker front. He did this only in 12 games, and was suspended for 4 contests due to a violation of the NFL’s drug policy. 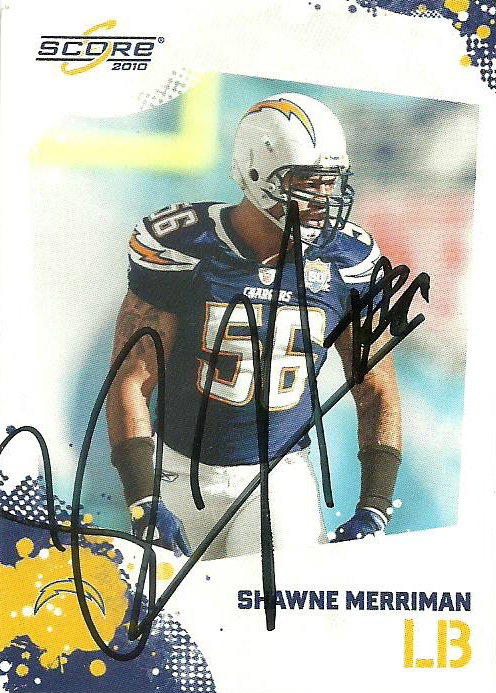 Merriman continued his banner play in 2007, earning a Pro Bowl Honor on the back of 12.5 sacks, a career high 54 tackles, 2 forced fumbles, and 4 pass deflections. It all came apart in 2008. Shawne played the first game of the season on a pair of torn ligaments in his knee, ending his year. 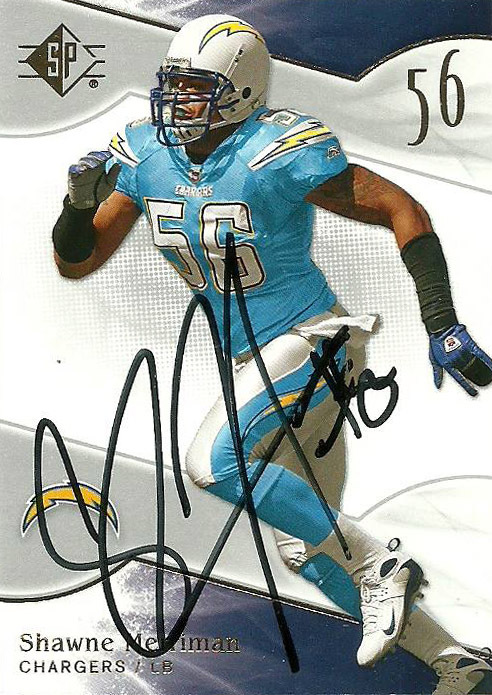 He came back for 2009, but nagging injuries kept him down to just 4 sacks and 26 tackles in 14 starts. Things just kept breaking into 2010, with IR his final destination after 3 games and just 1 start. He’d be released by the Chargers after the season, but not before being named to the Chargers 50th Anniversary Team. Shawne soon found himself on and off the roster of the Bills. Again persistent injuries played a huge part in the end of his season, and his career in 2013. He’d register 2 sacks, 19 tackles, and 1 pass deflection in 6 starts for the Bills- over two seasons. He’d retire at the grand ‘old’ age of 28. Shawne lives in the Los Angeles area. He’s gotten into different types of adrenaline sports- NASCAR, WWE, martial arts, and has made cameos on TV shows. He also has a foundation and a clothing line named after his moniker ‘Lights Out’.